Everyone has been sharing summer recipes – the bloody weather calls for it. Especially most of us in Kolkata are having a terrible time dragging ourselves into the kitchen in this humid hot peak of summer, hell it’s not even raining as it used to be – whatever happened to the Kalboishakhis that used to frequently storm into Bengal whenever there was low pressure in the atmosphere due to extreme hot weather. If that sounded too technical, pls forget what I just said and read on. Anyone who has been exposed to Malvani cuisine will know that Sol kadhi is to the Marathis what lassi is to Punjabis, Shikanji is to Delhiites and Aam panna is to Bengalis. 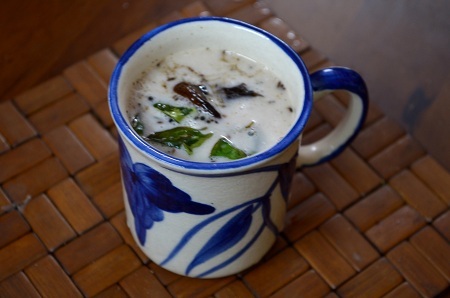 Although the sol kadhi is a brilliant cooling agent, it is often integral to the Maharashtrian meal round the year due to its digestive properties. The only effort would probably be getting your hands on some kokum which the sol kadhi is centred around. Kokum is a sour fruit found along the western coast, dried and used liberally for malvani cooking. Pl note this is only a different take on the original sol kadhi recipe that uses ginger-green chilly paste and coriander leaves for garnish. Hi Antara, try adding paste of ginger-green chillies and coriander to float. More cool.